Last May, San Jose, Calif.-based company Align Technology unveiled two game-changing intraoral scanners during the 118th American Association of Orthodontics Annual Session in Washington, D.C. – the iTero Element 2, and the iTero Element Flex. The company, which developed the highly popular Invisalign system 20 years ago, released the original iTero Element in 2015 as a means to offer dentists both high-precision scanning power and portability. Now, dental professionals will have even more options available to ensure the best fit for their practices. The Element 2 includes next-gen computing power, an expanded 21.5-inch touch widescreen, and an integrated battery to ensure uninterrupted scanning. The Element Flex, which is the ultimate choice for those who operate at multiple locations, allows for laptop connectivity, and includes a custom-designed carrying case. Each scanner maintains the same capabilities as its predecessor. So, why is it important to have so many options for intraoral scanning? According to a recent market analysis, the IOS industry is predicted to be at $442.3 million by 2023. Not all dental practices operate on the same level thus, as more and more clinicians shift toward CAD/CAM technology, it’s vital to have as much diversity in intraoral scanning as there is throughout the dental industry. Why the Shift Toward Intraoral Scanning? For over a decade, intraoral scanners have been staples for clinicians throughout the dental industry. By way of video or high-quality image capturing, the scanners create virtual copies of patients’ mouths. This allows for advantages such as quicker turnaround times (less chair-side visits, instant results, rapid lab turnaround); increased accuracy and predictability; and a better, more comfortable patient experience. The third advantage mentioned may be the most pivotal when it comes to owning a dental practice, as marketing becomes a huge factor. 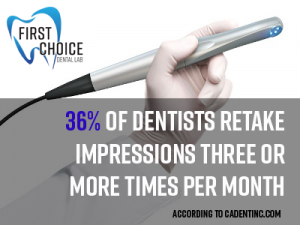 Typically, patients prefer less-intrusive impressions with less chair-side visits and faster results. Showing that those three “wants” can be achieved without having to bite into thick liquid, such as alginate or polyvinyl siloxane, while also showing them realistic 3-D scans of the inside of their mouths bodes very well for clinicians. Initially, intraoral scanning wands were bulky, and considered as difficult to use. Thus, when it came time to make a purchasing decision, most clinicians opted to forego it. Now, there are considerable options offered by a vast variety of companies designed to fit the needs of any clinician. 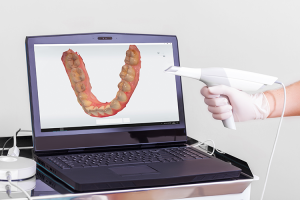 With the release of the iTero Element Flex, scans can be performed right onto laptops, which makes intraoral scanning more portable than ever before. However, that’s not the only big innovation in IOS scanning. The latest release from 3shape, the TRIOS MOVE, offers a totally wireless scan wand along with an adjustable arm and swiveling screen that allows clinicians to easily show patients the entire scanning process, as well as the treatment planning. From the size and design of a wand, to image capturing and the software’s ease-of-use, companies are diversifying their scanners like never before, and that diversity only stands to grow in the near future. Using an intraoral scanner can and will improve the relationship between clinicians and dental labs, and thus clinicians and patients. Thirty-six percent of dentists retake impressions three or more times per month, while another 36 percent must reappoint patients for impression-taking at least once per month. With greater accuracy comes a significant decrease in remake percentage – approximately 4 percent down to less than 1 percent. Also, newer scanners include shade-taking features that reduce the necessity of shade adjustments. And, both clinicians and labs can appreciate that intraoral scans can be uploaded in the matter of minutes, and that communication can be opened between the two almost instantly to streamline workflows. The end result: Clinicians will spend less time taking impressions, labs will spend less time on remakes, and patients will get better results. At First Choice Dental Lab®, we have several years of experience working with intraoral scans, and we accept files from every scanning software. Our team of seasoned lab technicians will help guide you through each case to ensure that both you and your patients get the most out of your intraoral scanner. Contact us now to learn how we can help you grow your dental practice. Already have an intraoral scanner? Send your file to us at info@firstchoicelab.com. Consistent Quality. Focused Customer Service. On-Time Delivery. Make us your First Choice! SHIP YOUR CASE TO US FOR FREE!